Spalling concrete or concrete cancer, as it is sometimes referred to, is caused by the corrosion of steel in concrete. The repair of spalling concrete is technical and it is not a matter of covering exposed reinforcement. Covered areas only hide the problems and over a period of time the problem re-occurs but at a more advanced level. Bells has qualified staff who can effect concrete and render rectification. 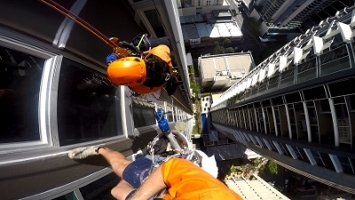 Using Rope Access ( abseiling) techniques rectification works such as full facade renovation, cladding installation and/or concrete rejuvenation are all in our service range. Bells have been conducting building façade inspections and identifying water leaks in buildings for many years, using traditional and proven methods of both visual identification and flooding techniques to either find the source or remedy the repair. In many cases rope access (abseiling) was the best method of getting to the area of concern. In partnership with Thermoscan Australia, Bells now has the capability to undertake thermographic surveys of a building envelope, glazing and framing, and substrata. Thermoscan’s imaging and interpretive expertise and Bells rope access techniques gives a building owner and manager a powerful new tool to find out what is happening with his/her building. Rope Access Inspections present a hands-on approach to the evaluation of structural components on bridges, buildings, ships, industrial structures, and towers. Rope Access technicians equipped with infrared or HD video cameras provides Bells with the capability to capture data, take digital photos or HD video, scope the structure and provide a comprehensive report of a building facade or structural envelope. This safe and cost efficient solution of access allows our partner engineers or builders to view data and assess the rectification works required.